Re: Got a good deal..
Lazy M wrote: We just got into the pig business too. Our youngest won the greased pig contest at our local fair.. they asked if he wanted a gift card or to keep the pig..
Nice.. will the pig be a special guest at the table or a pet? Lol are you going to build a outside pen? No I reenforced a barn stall to keep her in. Haven't had a pig for around 10 years and in 2 weeks she has already reminded me of the joys of how easily they root out of what I thought was a secure pen, how much fun it is to get them recaptured, and the smell of pig sh#t..
You are going to have to get a bigger trough. Those aint pigs no more they are hogs. They are growing. there was 14 troughs in there but it was so wet and them standing in it they all took on mud so I had the others in back of my truck to wash out at home those were some that weren't full of mud so I used those. 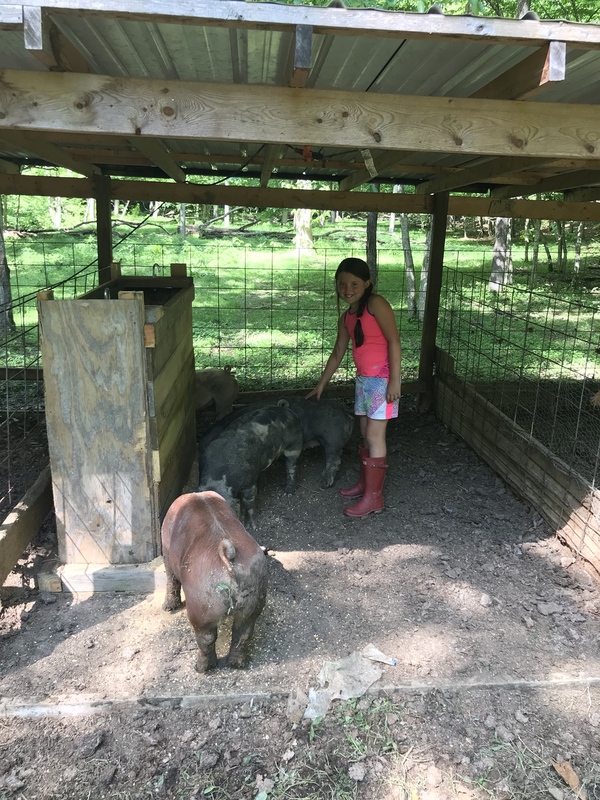 Yea too many for 2 of those but they had to make due I got one of my pretty gilts apparently was fighting or something hurt her leg so shes hopping on 3 legs hope she gets better so I can sell her. We raise 3 or 4 every year for our family. The pic was from May 23rd. They go to the butcher October 15th. They are fun to watch. Also make great use of waste from the garden. Nice I agree I like watching them grow and raise them I butcher my own. Mine will be killed Dec or early January. I've been buying bacon every week. They are very proud of their bacon. Even the off brands. You got a very good deal. backhoeboogie wrote: I've been buying bacon every week. They are very proud of their bacon. Even the off brands. Yes sir very proud of it. Have you ever thought about raising your own? I have considered it. There are no facilities here. It would mean starting from scratch other than I have some feeders. Dad used to panel the garden. He put pigs in during the off season. They wintered well here in TX. No weeds left in the spring. We also used to feed them trash fish. Gar etc. We fed fish guts when we cleaned fish. They got table scraps. Nothing went to waste. The folks who process my steers also process hogs. There is 17 acres here at the house. Each week when I buy bacon, your very thoughts come to mind. If you can all you needs a few cattle fence panels on solid posts 1 wire of electric won't hurt either need to have 2 pigs really so they compete on eating and grow better I like making my own bacon.